1st Payment proof from DreamMails. - Requested 26 Jun when reached $1. 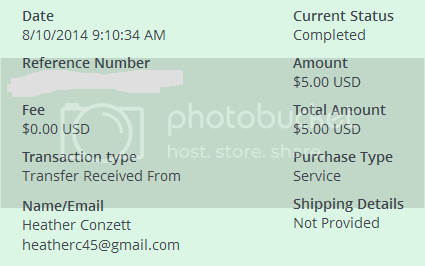 Received 05 Sep.
> Cash out: $1, PayPal or PayZa. 2nd Payment proof from DreamMails. - Received 50 days after request. > Cash out minimum $1, maximum 2,50 - PayPal or PayZa. 1º prova de pagamento de DreamMails. - Recebi 50 dias após requerer. Ao requerer, o membro entra na fila de pagamento. - $2,01 USD já descontada a enorme taxa do PayPal. 3rd Payment proof from DreamMails. - Received 41 days after request. 3º prova de pagamento de DreamMails. - Recebi 41 dias após requerer. Ao requerer, o membro entra na fila de pagamento. 6th Payment proof from DreamMails. 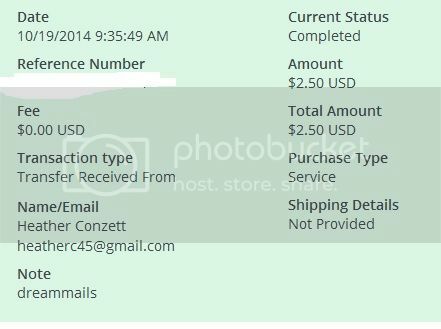 7th Payment proof from DreamMails. - $3 from DreamMails + $3 from StCashUnlimited joint payment. 8th Payment proof from DreamMails. 9th Payment proof from DreamMails. 10° payment received from DreamMails. - Average 4¢ / day.